Professional, expert service. Free quotes. Let FairLifts do the heavy lifting. Helicopter heavy lifts can be an ideal solution to hauling challenges throughout Arkansas, providing easy and fast heavy lift services in remote or heavily forested regions throughout the Ozark or Ouachita mountain ranges, in densely populated areas around Little Rock, or anywhere else. Alleviate the need for large spaces to deploy traditional ground cranes - or concerns about adequate access roads. Helicopter lifts can haul large loads and assist in precision placements, making them ideal for HVAC units, and so much more. FairLifts can arrange the ideal helicopter for any hauling need. Our experts at FairLifts can help determine which helicopter will work best and make reservation arrangements. Sikorsky S64 “Skycrane: A perfect machine for projects requiring big muscle and precision lifting or placing. Possessing twin turboshaft engines, this helicopter capable of hauling up to 20,000-pound payloads. Boeing CH-47 Chinook: An American twin engine helicopter capable of hauling up to 26,000 pounds and equipped with a three-prong cargo hook, it can handle the biggest jobs. For jobs requiring less brute power, the Bell 212 or 214 series are popular choices. Whether it’s because of access issues in remote spots of Arkansas, or because there simply isn’t enough room on site, heavy lift ground cranes can’t get everywhere they are needed in Arkansas. That’s why aerial heavy lifting services are so valuable. Helicopter “skycranes” can haul heavy equipment like heating and ventilation (HVAC) units, advertising signs, towers and antennas, or anything else that needs moving. They can help precisely place large objects for easy installation and do it all in a fraction of the time, saving time and headaches. Plus, helicopter support can pull double- or triple-duty on a job site, not only placing HVAC or rooftop units, but also delivering supplies, personnel or other heavy equipment. And helicopters can do it all regardless of road conditions, traffic, environmentally-restricted areas or any obstacle that would make traditional crane methods impossible or impractical. Constructing towers in remote or rugged terrain, such as western Arkansas, for instance, can be a challenging job without helicopter support. Utilize the power and precision of helicopter lifts to haul in and place large grid towers or antennas. It’s fast and efficient. 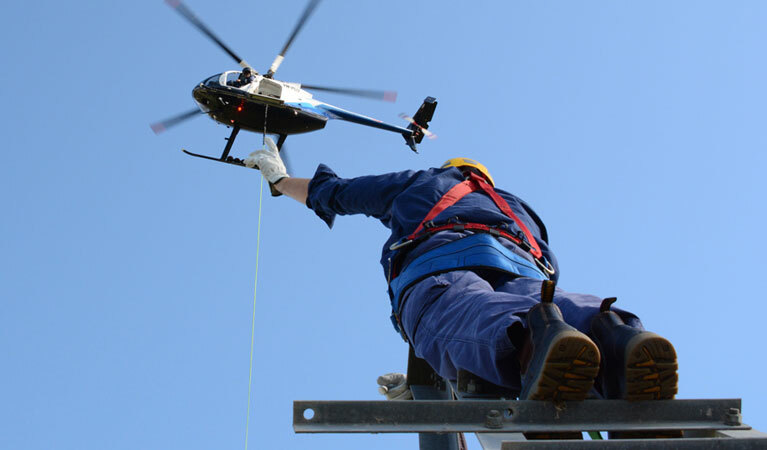 Heavy lift helicopters can make quick work of placing high-visibility advertising on rooftops, hilltops, roadsides or anywhere else without the need for large ground equipment, climbing gear or putting crews to work at dangerous heights. Helicopters place advertising signs quickly, efficiently and safely. Heavy lift helicopters are equipped with external hooks or slings to haul almost anything. Skilled, experienced pilots work with ground crews to help place items with precision, making them perfect for jobs like placing bulky HVAC units on rooftops. Helicopters can swoop in and do the job quickly and accurately, which saves time, especially on jobs where multiple units have to be placed at different sites on a building. A ground crane would likely have to break down and reposition, whereas a helicopter just picks up the next load and hauls it into position, saving valuable time. Helicopter lifts can be a vital member of any construction team looking to boost schedule efficiency. Able to haul in equipment, large rooftop items like HVAC units, supplies or even grading materials, helicopters help construction crews avoid delays and remain on schedule. Helicopters make heavy lifts easy work. FairLifts makes reserving aerial support even easier. Our experts are standing by 24/7 to answer your questions about how heavy lift helicopters can help your particular project, provide free quotes or reserve your helicopter service anywhere in Arkansas. Call or use our contact form today to get started.